Recently I was recommended a short book to read called The Go-Giver by Bob Burg and John David Mann. Seeing as I was going to be spending some time on a plane I thought it would likely make a good choice as something to get through quickly while traveling. The book is written in the form of a parable explaining five laws to stratospheric success. The tag line for the book is “A Little Story About A Powerful Business Idea”, but as far as I’m concerned it can be applied to life in general. It’s not a hard read, but very engaging and it really explains the principles in an easy to grasp and fun way. I won’t give away all the laws but, the main idea is that giving to people without the expectation of anything in return, as the secret to be hugely successful. Even though I’ve seen some of these things hold true in small ways in my own life I would have still been a little skeptical. However by looking at the concepts and comparing them to Open Source, and WordPress in particular, you can see how it can be true. The whole concept of open source is just that, people contribute to a project because the believe in it or think it is important. In the case of WordPress the project itself, and many people, have become very successful. There is a large number of people who make their living using, building on, or supporting, WordPress. The results of the 2014 WordPress survey had over 7500 people making their living with it. There are are many other parts of the book that relate as well, but I’ll leave it for you to read, but think value, and influence as a couple others. Even without this I’d recommend the book, I can see me reading it a few more times to really try and absorb it all and trying to live closer to concepts in it. Tonight I attended my first ever WordPress meetup. When I found out that Alison and Tara were organizing a meetup in Halifax I was very excited. Seeing co-workers going to meetups and WordCamps talking with others who are either passionate about, or wanting to know more and learn about WordPress had me a bit envious. It was a really great evening, the first talk was about the differences between WordPress.com and WordPress.org. This is a complicated topic that has a fair amount of confusion around it and they did a great job at laying things out. Over the years I’ve helped people in person to use WordPress but it was really neat tonight to get to engineer some happiness in person and I look forward to doing more of it in the future as well. I’m far from an outgoing person, but I found it really easy to talk to everyone tonight and can even see myself doing a talk at some point. Thanks again to the organizers and everyone who came out. I’m looking forward to seeing you all again. We have a bit of a debate going on in my house, which W logo is better? 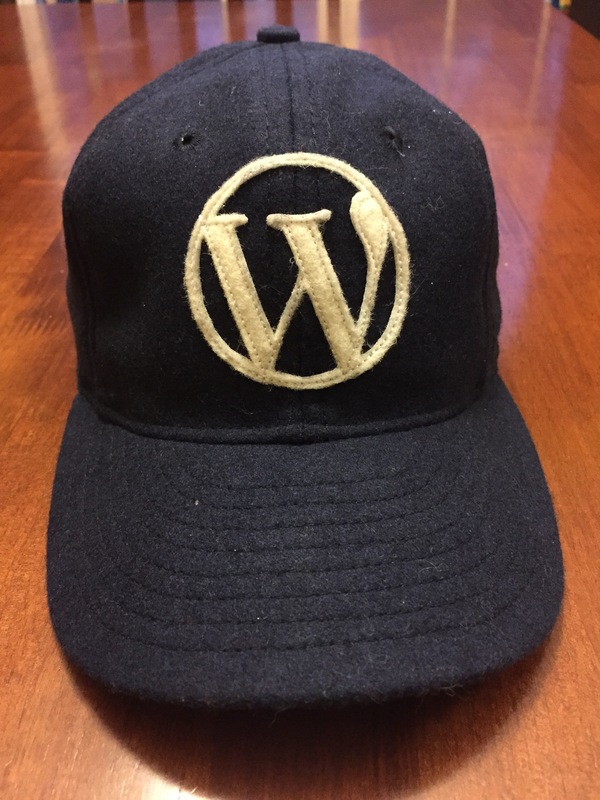 As anyone who knows me I might have a bit of an obsession going on with WordPress swag. There are an awful lot of things in my office and life that have the WordPress logo front and centre. My wife on the other hand has had a crush on Donnie Walhberg since the New Kids on the Block came on the scene many years ago. So when their family opened the Walhburgers Restaurants she decided she needed to get a bit of their swag. That nostalgia is pretty hard to compete with. My newest piece of WordPress swag arrived in the mail the other day, and I love it. I think this is my favourite one yet because I can wear it everyday. When I go out I almost always wear a hat. I have a couple I alternate but I haven’t worn any other one besides this since it got here. If you want one there are still some left at http://freedomzero.org/. Thanks Nick! It made it here crazy fast after I ordered and he threw in a Wapuu keychain.